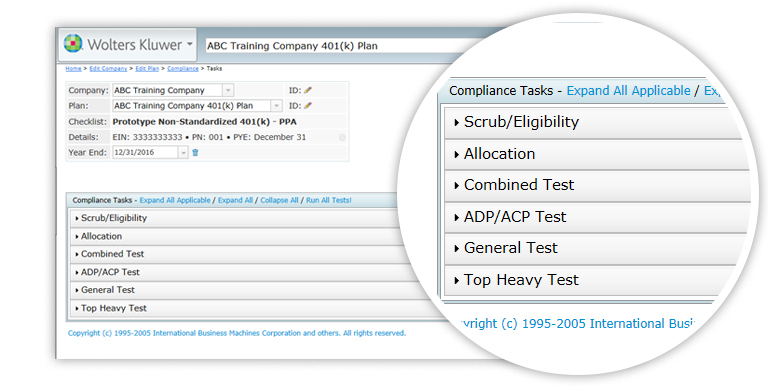 ftwilliam.com’s Compliance Testing and Reporting Module helps you streamline your census preparation and manage your plans’ testing and reporting with ease. Our Compliance module offers fast calculations and report generation and integration with the Plan Document, 5500 and 1099 modules, including import of plan specifications from the Plan Document module, and export of participant data to the 5500 and 1099 modules. The module offers a wide range of testing options. Many customers also report efficiency gains through the use of our customizable grids. Our accounting platform is appropriate for balance forward recordkeeping with participant statements. For plans on an investment platform, we offer the option to import financial data. The Compliance Testing and Reporting Module is an all-inclusive package – all features and options are included at no additional charge, including unlimited concurrent users. Our pricing is based on the number of plans; we do not charge extra for add-ons, e.g. loan module, cash balance, user guides, Help Center, or online user group. Three free hours of training and conversion training are standard with purchase. NEW – Custom report writer, payroll data accumulator, and distribution processing feature! WorkFlow management helps you supervise all your plans’ compliance testing and reporting. Assigns plans to administrators, keeps track of which plans’ data has been received, processed, tested and reports printed. Mapping of plan provisions map from the document module to the compliance module. Our PensionPro partnership allows the status of your compliance work to flow seamlessly into PensionPro’s Workflow software for greater control and efficiencies. I have found TAG a very useful resource over the years, and the team has been always professional and reliable.